The author Ann Rosmans site where you can read about her writing everyday and if the books Fyrmästarens daughter, Soul coffin, Porto Franco guardian and Mercurium. An application for clemency. The true story of Metta Fock - only female prisoner at Carlsten Fortress. In 1806 arrives Metta Fock Ridderbielke to Marstrand, Carlsten Fortress, accused of MURDER BY POISON. Throughout the lengthy trial, she denied the allegations, and now she's doomed to sit "in confession." Isolated in the fortress on the barren island of she will stay until she recognizes or go under - whichever comes first. Without the possibility of contact with the outside world, with no pen or paper, she begins to embroider. Word for word takes a desperate clemency shape. Henry on Mercurium out now! 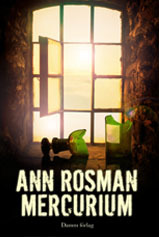 The author Ann Rosmans website - here you can read about Ann's writing everyday and her books Fyrmästarens daughter, Soul coffin, Porto Franco guardian and Mercurium.